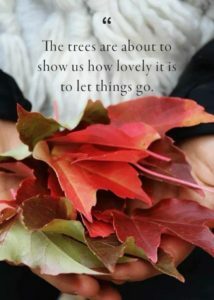 I was scrolling through Facebook last week and I saw a beautiful fall picture with leaves collected in open hands. The quote read, “The trees are about to show us how lovely it is to let things go.” Somehow, that spoke to me, right at that time, at this season, right in this place in my life. Letting go is usually held in a negative light: having to let go of a loved one as they pass away, let go of a dream that may not come to fruition, letting go of a job or position you had hoped to get. This message was saying the opposite. It was in fact, “lovely”, to let things go. I encourage you, in this season of fall, as you may catch the glimpse of a falling leaf, to remember that “the trees are showing us how lovely it is to let things go”. Ask Jesus to help you and rest in the act of letting go.